another corner of this room. 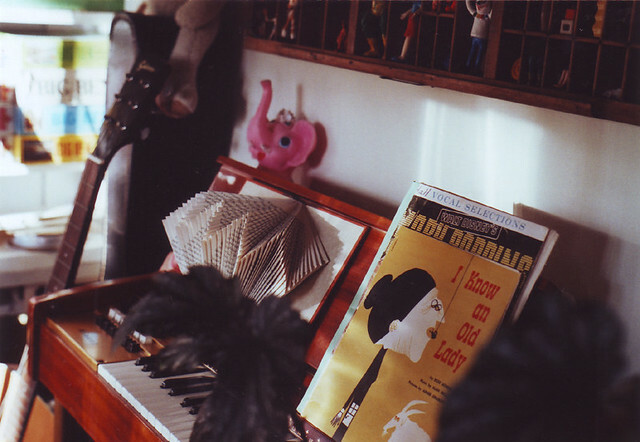 featuring my little organ, a pink elephant that lights up and a book i folded after learning how from betsy. david and i will be making some more folded books to sell at our local holiday market. i've decided to start having special sales at plastic foliage for imaginary animal readers. you can find the info over there in the sidebar. december's sale is 15% off your total purchase. enter IMAGINARYDECEMBER when checking out. there are loads of potential christmas gifts in the shop right now! aren't these foxes cute? i don't know how you could get just one, though. they look so good in a pack. also, this shop has some really pretty earrings.